कनिष्क की स्वर्ण मुद्राएं, जिनमें यूनानी सूर्य देवता हेलिओज़ का चित्र अंकित है। (ई. १२०). कनिष्क के काल के आरम्भ के कुछ सिक्कों पर यूनानी भाषा एवं लिपि में लिखा है : ΒΑΣΙΛΕΥΣ ΒΑΣΙΛΕΩΝ ΚΑΝΗϷΚΟΥ, बैसेलियस बॅसेलियॉन कनेश्कोऊ "कनिष्क के सिक्के, राजाओं का राजा"
↑ फाल्क (२००१), पृ. 121–136. फाल्क (२००४), पृ. 167–176. ↑ Gnoli (2002), pp. 84–90. ↑ Sims-Williams and Cribb (1995/6), pp.75–142. ↑ Sims-Williams (1998), pp. 79–83. ↑ Sims-Williams and Cribb (1995/6), p. 80. 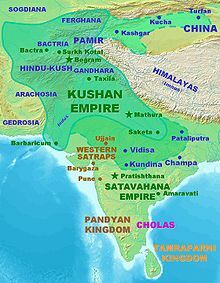 ↑ "The Rabatak inscription claims that in the year 1 Kanishka I's authority was proclaimed in India, in all the satrapies and in different cities like Koonadeano (Kundina), Ozeno (Ujjain), Kozambo (Kausambi), Zagedo (Saketa), Palabotro (Pataliputra) and Ziri-Tambo (Janjgir-Champa). These cities lay to the east and south of Mathura, up to which locality Wima had already carried his victorious arm. Therefore they must have been captured or subdued by Kanishka I himself." Ancient Indian Inscriptions, S. R. Goyal, p. 93. 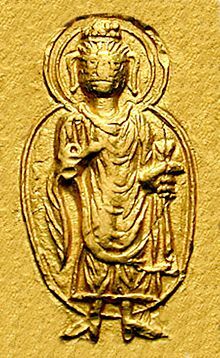 See also the analysis of Sims-Williams and J. Cribb, who had a central role in the decipherment: "A new Bactrian inscription of Kanishka the Great", in Silk Road Art and Archaeology No. 4, 1995–1996. Also see, Mukherjee, B. N. "The Great Kushanan Testament", Indian Museum Bulletin. ↑ Chavannes, (1906), p. 232 and note 3. ↑ Hill (2009), p. 11. ↑ वुड (२००२), illus. p. 39. ↑ Sims-Williams (online) Encyclopedia Iranica. ↑ H. Humbach, 1975, p.402-408. K. Tanabe, 1997, p.277, M. Carter, 1995, p. 152. J. Cribb, 1997, p. 40. References cited in De l'Indus à l'Oxus.